14 Sep Is mutton due for a moment in the sun? The Eastern States Trade Lamb Indicator (ESTLI) eased this week despite declining supply at the saleyard and low slaughter figures, suggesting softening demand. In contrast, mutton prices have managed to gain ground despite stubbornly high throughput numbers for the last month and very much above average slaughter figures. Perhaps there’s something other than saleyard volumes and slaughter levels impacting the price at present. The weekly trend in throughput for the 2018 season for lamb and sheep is highlighted in Figure 1, along with the respective five-year average pattern for yarding levels. Lamb throughput has dropped 30% from the previous week and sits 23% below the seasonal average. The low supply of lamb at present is replicated in the weekly lamb slaughter figures which are running 25% under the five-year average. In contrast, sheep yarding has been holding firm above the average trend for eleven weeks now and currently sits 57% higher than the seasonal average. 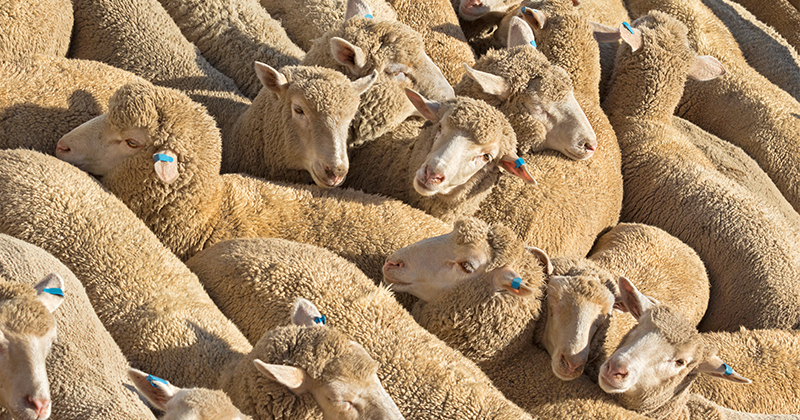 High saleyard numbers of sheep are flowing through to elevated mutton slaughter levels with the weekly sheep slaughter running 50% above the five-year average level. Despite the alternative supply scenario for mutton and lamb, this week prices have responded against conventional wisdom with the ESTLI dropping 3% to close at 855¢/kg cwt while East coast mutton has managed to firm 2% to hit 481¢/kg cwt. Perhaps the missing element is demand and more specifically offshore buying. Recent trade figures have shown declining volumes for lamb exports while mutton export levels have managed a stellar performance over August. A clue to the waning offshore demand for lamb and the firmness of offshore mutton markets could be the relative historic levels of each commodity in foreign currency terms. The ESTLI is US$ terms has been approaching levels unseen offshore since the 2010/11 peak at around 670US¢/kg cwt (Figure 2). In contrast, the offshore mutton price in US$ terms is only marginally higher than this time last season and remains over 100US¢/kg below levels recorded during the 2010/11 highs (Figure 3). Perhaps there is some further upside for mutton in the short term, particularly if supply begins to tighten. At the very least, mutton prices may be able to hold their ground in the face of a weakening ESTLI as the Spring flush gets underway.